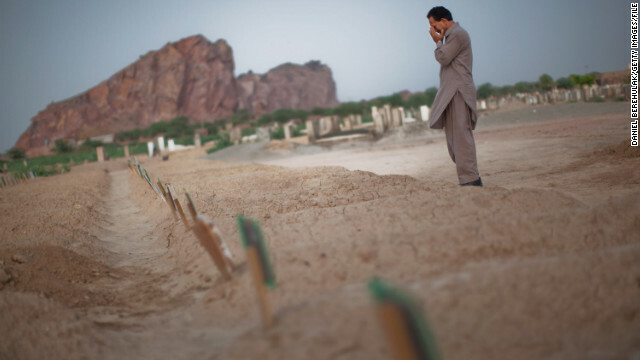 A man cries as he prays at the graves of the victims from the May Lahore attacks against Ahmadiyya community mosques July 14, 2010 in Chenab Nagar, Pakistan. Editor’s Note: Qasim Rashid is a national spokesperson for the Ahmadiyya Muslim Community USA. Follow him on Twitter @MuslimIQ. Sometimes that bigotry is peripheral. The other day I tweeted a quote from Minnesota Rep. Keith Ellison praising the head and Khalifa of the Ahmadiyya Muslim Community, Mirza Masroor Ahmad, “… under (your holiness’) leadership the Ahmadiyya Muslim Community has been a true blessing for us here in the United States." Like clockwork I lost a dozen followers. Sometimes that bigotry is direct. “You Qadiani mother--er! You will burn in hell for your beliefs! You godd- Jewish agent I’ll kill you!” No comment. Look, I’m not looking for special treatment. Nor do I want sympathy. But I do want one thing for the sake of humanity: That Muslims condemn all forms of religious bigotry—peripheral, patronizing, direct and violent. While this simple request is what’s right, some turn a deaf ear, despite Prophet Mohammed's pluralistic example. Mohammed championed religious equality in the Charter of Medina he signed with Jews. He assured protection of religious freedom in his letter to Christian monks at St. Catherine’s Monastery. He also afforded all Arabs carte blanche forgiveness when peacefully retaking Mecca—on the single condition that religious freedom reign free. Even Prophet Mohammed's rules of war were specifically designed to protect, not persecute, religious freedom. Now Pakistani Sunni Muslims massacred Shiites – over 100 Shiites were blown up in Quetta. Pakistanis also butcher Ahmadi. Early last century, people were not very sensitive to the plight of Jewish people in Germany. And they left it up to Germany to figure it out how best to treat their own Jewish people. That was a very insensitive position – that was neither a moral nor a practical position. Treatment of Jews by Germany spilled over its borders and the whole world paid the price in many subsequent wars. Pakistan can not be allowed to treat its Ahmadi people in such a terrible way. The rest of the world needs to take a decisive and strong action to prevent persecution of peaceful and innocent Ahmadi people in Pakistan. egad – doesn't god get lost in all that? Muslims need to learn about deodorant. It is an item civilized human being apply externally to the arm pit region in order to avoid body odor. "Do NonMuslims get treated like second hand citizens in Pakastan?". = Much worse than that. They are being butchered in Pakistan. in USA religious groups that hold a strong non-violence creed – like the Quakers – do exist. these are distinct religious groups that choose to live apart (more of less) from the main of society in order to keep their non-violent life style and sequestered religious training intact. They still occassionally suffer from violent attacks upon them – like other children in this country unfortunately do when at school – but they are allowed to live as they please – and probably would have no trouble getting a passport and yes – they might have that they are a quaker on their headstones – but if they were a christian quaker – they could say that too. The mideast is not USA in this respect – again – why would USA have the answers for this dillemma? Pakastanis need to deal with their own government in order to shape it into something that is sustainable for all its people in accordance with the world in which they live. The USA is vastly different at this point in time in this respect – although if you look further back in history – there might be more peaceful solutions – i do not know. Quakers differ in some of their beliefs. However, they are free to pursue their beliefs in America. In the first 100 year, Rhode Island had 36 governors who were Quakers. Today, some Quakers own very large businesses and are flourishing. Quakers never had to denounce their beliefs just to get a passport. On the other hand, Ahmadi do not even have basic human rights in Pakistan where they are relentlessly persecuted. Early last century, people were not very sensitive to the plight of Jewish people in Germany. And they left it up to Germany to figure it out how best to treat their own Jewish people. That was a very insensitive position - that was neither a moral nor a practical position. Treatment of Jews by Germany spilled over its borders and the whole world paid the price in many subsequent wars. Pakistan can not be allowed to treat its Ahmadi people in such a terrible way. The rest of the world needs to take a decisive and strong action to prevent persecution of peaceful and innocent Ahmadi people in Pakistan. wwiii is not an impossibility about this time in history is my thought – and it seems that right now the mid-east keeps pushing the world to jump in – especially USA – and I for one – do not want to see that happen. Why can't you go to your government and demand change like India is doing right now? Why do you need the rest of the world to get involved? People killing other people over their fairy tale beliefs. Worst part is, they didn't even choose these beliefs based on any real reason, they are just believing what their parents taught them to believe. And now they're going to die for it. Religion... sigh. Those killing others should be punished harshly. Everyone should be free to believe in what they want. Those denying them their rights are the Islamic ultra right wing people who wouldn't let women and minorities have any rights. There are many Islamic governments who deny others to exercise their basic freedom and human rights. Well, in history is any guide, Islam and human rights don't mix very well. i remember now seeing this one movie with mid-east people drama in it – don't remember to much about the movie except this one scene of men in mid-east dress advancing in protest in mass upon these soldier guards over something these people in mass thought was rightfully theirs (a freedom from violence was one of these things they thought was rightfully theirs). This mass of men with no weapons would keep walking up these soldiers – and the soldiers kept beating up the ones in the front – and the mass of men kept advancing without fighting back – just letting the soldiers beat them. i don't remember how it ended – i think i turned the movie off – could stand to watch too much of it – but they were mid-east men against mid-east men – and they took the beatings – in mass – and non-violently. wish i could remember what movie that was. The condition of Ahmadi Muslim in truly appalling. The Islamic Republic of Pakistan denies the basic human rights to Ahmadi people. In applying for a passport or a national ID card, all Pakistanis are required to sign an oath declaring Mirza Ghulam Ahmad to be an impostor prophet and all Ahmadis to be non-Muslims. Because he was an Ahmadi, the word "Muslim" was erased from the gravestone of the Nobel prize winning theoretical physicist Abdus Salam. These are egregious violations of very basic human rights. Islam is Judaism 3.0 blending the Hebrew stories with Arabic culture and other pagan beliefs. and interpretations of the Quran. The plight of Ahmadi Muslim is truly heart breaking. There are Islamic countries such as the Islamic Republic of Pakistan which deny the basic human rights to Ahmadi people. In applying for a passport or a national ID card, all Pakistanis are required to sign an oath declaring Mirza Ghulam Ahmad to be an impostor prophet and all Ahmadis to be non-Muslims. Because he was an Ahmadi, the word "Muslim" was erased from the gravestone of the Nobel prize winning theoretical physicist Abdus Salam. These are egregious violations of very basic human rights. Ahmadis are harassed by schools, universities and teachers in Pakistan's Punjab province. The harassment includes social boycott, expulsions, threats and violence against Ahmadi students by extremist students, teachers and principals of the majority sect. There is a lot of leverage civilized countries have over these Islamic countries like Pakistan, Bangladesh and Indonesia in terms of economic aid. The NATO and UN should take up the cause of Ahmadi muslims. Sunni Muslim countries need to be stopped from butchering the peaceful Ahmadis. I am sure in some type of aestetically peaceful way that this prophet(s) will forgive you for saying such a thing to get these pieces of identification that you may need to peacefully conduct your life in accordance with their precepts and your beliefs of the same. you just have to forgive yourself – if you can't – than peacefully try to change your government – but don't ask USA to do it for you – not if you want it done peacefully and for your own benefit. does that make sense? The new and modern prophet, Mirza Ghulam Ahmad, reformed Islam and made it superior by eliminating jihad. Prophet Mirza Ghulam Ahmad clearly showed that he was superior to the primitive prophet Mohammed. This fact has angered the Sunni Muslims, who want to deny the Mirza Ghulam Ahmad his important place in history as the true reformer of Islam. Sunni Muslims are expressing their anger in the only way they know of: oppression of minority by violence and injustice. well – if amhadis do not believe in jihad – than how did this prophet propose to reform muslims who do believe in jihad (and / or violent jihad). How did he instruct his followers to make change without violence? How do you plan to face the violence against your nonviolence – with more violence after your backs get pushed to the wall one too many times? they are applying violent jihad then – to enact understanding of the need for violence in response to their violence as a means to control their violence, and as a natural defensive reaction to their violence – flight or fight – they will make you leave – one way on another – which is what they probably want to begin with. so – how do you stay – and not fight? (you do if you expect the USA to come to your rescue – because that is what would happen in USA – police / military / and / or militia would solve the probelm – with violence). why do you ask USA for help? do you think USA has a patent on – nay – even a history of – turning the other cheek? I will like to point out three things No 1. The Holy Prophet (PBUH) have told us that the superior Jihad is against oneself, the task of reforming oneself. The other Jihad has always been inferior to this and only allowed in periods of extreme persecution and then again only in defense ( I know this is not the view propagated by political Islamists but it is true). No 2. the Holy Prophet (PBUH) prophesied that the Messiah will end warfare and fighting. No.3. Never in any words spoken or written or any gesture has the Promised Messiah (A.S) ever proclaimed that he is superior to The Holy Prophet (PBUH). @ Thoughts – You are clearly trying to justify violence as a response for violence. However, Ahmadi never committed any violence against your kind of violent Sunni Muslim people. So, why are you trying to justify violent revenge when there was no violence by Ahmadi against your Sunni Muslims? Sunnis are terrorizing Ahmadi, whereas Ahmadi are being true to their modern prophets teachings and are not retaliating against their Sunni oppressors. @ Thoughts2 – Have you heard of a fine American civil rights leader, Martin Luther King? Probably not, because you seem to be too busy trying to justify violence like those founders of Al Qaeda, Sunni Muslims. The arguments you came up with are the primary reasons why Islam is viewed as a violent religion. Your arguments try to nullify all the good work done by the Ahmadi Prophet Mirza Ghulam Ahmad to take the violent jihad out of Islam like a malignant cancer and transform it from a primitive, violent version into a modern and respectable religion. i am not advocating violence in any way – read it again with an eye for someone asking why the USA is being lamated to about the muslims problems between sunnis and amahdis in mid east. i didn't even know amahdis existed – or had this problem until i read this article – altho i have heard the term sunni mentioned before – i have not been following along to closely. i simply want to know how the 'newer' muslim phrophet (don't even know his name) taught his followers how to change the concept of violence as a means for jihad and/or self-defense into something that isn't violent (if that is what he did – i do not know except for this conversation). What did he preach as the logical – workable solution to this gentleman's worries about being murdered for believing him (the new prophet) in the first place??? @thought3 – The new prophet taught peace and non-violence. And he wanted Islamic people to give up the failed jihad ideology. Jesus, Gandhi, and Martin Luther King followed the path of peace and non-violence - they succeeded and are remembered for their victories. because ... that is the way people are. so – what does the prophet Amhadi teach how to enact change in non-violent ways? and how to react to violence with non-violence? so how does the newer muslim prophet propose to become more than human in response to violence and as a tool for enactment for change – if necessary? why do the muslims actually ask the USA for help in resolving these issues for them? because of martin luther king? The new and modern prophet, Mirza Ghulam Ahmad, reformed Islam and made it superior by eliminating jihad. Prophet "Mirza Ghulam Ahmad clearly showed that he was superior to the primitive prophet Mohammed. This fact has angered the Sunni Muslims, who want to deny the Mirza Ghulam Ahmad his important place in history as the true reformer of Islam." This is what happens when groups question the beliefs of others, even when it is within the same religion...and again, it has been going on since belief systems were enacted. You, yourself, just called the Sunni's beliefs inferior; you don't see where that may cause strife? Do the peaceful Ahmadi's deserve to be slaughtered for their beliefs? Of course not, nobody does. And before you start patronizing me, I do not condone violence of any sort. You seem to want to ignore the success of peace and seem to suggest that violence will win, not peace. Well, I have to admit that there were Americans like Martin Luther King who took the non-violent approach. We also have Americans who prefer your approach and try to bring peace in Pakistan using drones. When you look at Ahmadi oppression by these Sunni terrorists, it seems that somebody has taken your advice and pounding some sense into Sunni oppressors using modern technology like the drones. In any case, the jihadi thinking of primitive form of Islam needs to stop. Either it can be done by following the modern prophet's non-violent and reformed Ahmadi path. Or, take your advice and use a violent path which uses modern technology like drones. Modernization will happen. Which path would you take? I am not ignoring anything. You seem to ignore that when belief systems clash, violence invariably happens. So there are peaceful Muslims; very worthy indeed. It will take a little longer than a mere one hundred years of a "new prophet" ideology to erase 1000 years of the "old profit's" ideaology. Christianity has had its share of religious wars between factions of the same faith; there are still conflicts between the factions. Why on earth would you think that Muslims be any different? And of COURSE peace is the better path over violence; however, when one faction knows that their opponent will not fight back, the opponent is going to get mowed down. Do you expect that the people who believe their way is the true way to say, "oops, my bad?" it seems to me that you are purposely misunderstanding what is being said in this conversation. so ... what is the PRECISE way to peaceful resolutions in this amhadi /sunni conflict per the phrophet amahdi? what is it for the phrophet muhhammad? maybe the true answer lies in the middle between the 2? Thought, I believe that Jim is a poe, and that his information has been directly lifted from this article...I'm not going to give him any further attention, as I believe he is being deliberately disingenuous. It is very simple. Old Islamic ideology MINUS violent jihad is equal to the modern Ahmadi belief. Violence is not a part of Ahmadi beliefs. Ahmadi want to practice their beliefs. When Sunni Muslims try to kill Ahmadi for being non-violent, the donors of Pakistan need to step up and use the aid as a leverage to stop this oppression of Ahmadi by Pakistanis. Obviously it's not that simple, since the proponents of the old ideology are not accepting it. Since you feel you have the answers, Jim, might I suggest a trip to Pakistan to help those people who believe the old ideology along? through the teachings of masters such as found in the buddhist, taoist, zen, etc., etc., etc. spriritually based practices of religious like thought and teachings, etc. that to ask these scientifically educated populace whom have access to vast amounts of knowledges and understandings on the internet, etc. to believe in past beliefs that perhaps gave basis and inspiration to that which followed – but is not the end all of all times or knowledges – and is thus – non self-sustaining in a belief that does not encompass growth of knowledge and understanding of all truths and being as it is or could be – is to not respect the intelligence and minds and personage of even themselves – not to be disrespected nor disrespectful in any way – only to point out that perhaps too much is asked to put others into the cloak of blind faith and adherance to the past that disregards the realities of the present and the potential of the future ... so you try to live in the past – and destroy your present and your future – where is the intelligence in that – and why do people continually fear monger or allow to be fear – mongered into this destructive vision of the future based upon the past? The mideast has problems in their environment that have shaped who they are in terms of societies – like earthquakes, flourid, and lithium, etc., etc., etc. ....... they have got to educate themselves to who they really are – in comparison to others who live in other environments – and see that there are differences – if based nothing else on the environment in which they find themselves in – if nothing else. look at yourselves – understand the true nature of your problems – and live in accordance with the nature of your environment ... do you want to be us or you, and why do you want us to decide for you? Living in present moment is the best way. Mirza Ghulam Ahmad tried to transform the primitive and violent Islam into a more peaceful form for modern day. Ahmadis hold that Muslims have erred with regard to the rights of creation for they, unjustly raising the sword and calling it Jihad, have misunderstood the concept and purpose of jihad in Islam. That's right. Ahmadi do not preach jihad. This makes them a target for attack by Sunni Muslims. Modern form of Islam (Ahmadi) is far more peaceful than the primitive form of Islam (Sunni) which is filled with violent jihad. then it seems – from first thought – that it is up to the newer generations to help the older generations understand and live a more peaceful form of co-existance – if indeed that is their stake in the muslim community – a different understanding of jihad that is more peaceful than their ancestors planned for. if you can succeed – you might be able to help the usa cope better with its outdated perspectives on warfare and violence as well. good luck! Ahmadis are harassed by certain schools, universities and teachers in Pakistan's Punjab province. The harassment includes social boycott, expulsions, threats and violence against Ahmadi students by extremist students, teachers and principals of the majority sect. There is a lot of leverage civilized countries have over these Islamic countries like Pakistan, Bangladesh and Indonesia in terms of economic aid. The NATO and UN should take up the cause of Ahmadi muslims. Sunni countries need to be stopped from butchering the Ahmadis. One hit wonder, your 5 minutes are up. The plight of Ahmadi Muslim is heart wrenching. There are Islamic countries such as the Islamic Republic of Pakistan which deny the basic human rights to Ahmadi people. In applying for a passport or a national ID card, all Pakistanis are required to sign an oath declaring Mirza Ghulam Ahmad to be an impostor prophet and all Ahmadis to be non-Muslims. Because he was an Ahmadi, the word "Muslim" was erased from the gravestone of the Nobel prize winning theoretical physicist Abdus Salam. These are egregious violations of some basic human rights . In Bangladesh, fundamentalist Islamic groups have demanded that Ahmadi Muslims be “officially” declared to be infidels. Ahmadi have become a persecuted group, targeted via protests and acts of violence. It is about time someone did something to stop this religious persecution of Ahmadi Muslims. Unfortunately, bad stuff happens to those in the wrong cult. Get over it – it is the way of religion. Wrong cult? How could you say such a thing? Ahmadis are the victims here. Are you a Sunni Muslim. That would explain your thoughtless comment. The point is that there are countries like Pakistan which are passing laws to persecute a set of people just because of their religion in this days and age!! Any other believer's cult is the wrong cult. . .
You can continue calling other people's beliefs wrong cult. However, it is clear that Ahmadi is a modern form of Islam which is much more tolerant compared to the narrow minded old Islamic beliefs. Their prophet is also a relatively modern who brought in some much needed reforms. The more I read about it, it sounds like a real religion, which is much superior compared to the old Islamic text. there is no "right" one. I don't suppose, Jim, that it ever occurred to you that Sunnis consider Ahmadi's the wrong belief, hence, all of the infighting? I don't condone the madness, and I agree the persecution must stop, but this has been going on since there have been belief systems put in place. I don't see it ending any time soon. I wish the author luck. For a simple, safe, peaceful and quick solution to the ignorance that is in all forms of Islam, see The Five Steps To Deprogram 1400 Years of Islamic Myths on p. 1. Freedom of conscience is one of the fundamental rights of humans enshrined in the Qur'an; it is therefore, absurd for anyone to suggest that Islam allows putting people to death just because they convert to another religion. I should further state that all of the moral teachings of the Qur'an are based on the notion of moral responsibility, which entails the freedom of choice. Therefore, to state that one must be put to death for choosing to disbelieve would only undermine the entire moral edifice of the Qur'an. These are the words of God, no matter what you believe in they should surrender you to Human conscience ! Please do not listen to this person who prays that he wont get murdered, Muslims that follow the true path of our beloved prophet dont kill, the Al Quida's and Bin Ladens of the world were no different from the crusaders or the nazi hitlers, Hitller was a christian, we dont label all christians Nazis, come on this 2012, there will always be extremists who ruin the image of a faith, but were smarter than this? or are we ? @Ray – You are saying that Qran does not specifically tell the Sunni Muslims to kill Ahmadi Muslims. However, I am not sure why the Sunnis Muslims still do it so ruthlessly. It's a fact, and you can look it up. Ahmadi Muslims are being butchered in Pakistan. Pakistan's former president Zia Haq brutally persecuted Ahmadi Muslims. Zia Haq made specific laws to make the life of Ahmadi Muslims miserable in Pakistan. So, why do Sunni Muslims brutally butcher Ahmadi if Qran does not ask them to as you mentioned in your message? pakastan receives aid – needs warfare to keep aid flowing??? if there is conflict – the money will continue to flow in – even if it is conflict between muslim sects? or do muslims really not have the ability to be religiously open minded? what is the sunni's point of view? Everyone has the basic and inalienable right to religious freedom – including the Ahmadi Muslims. Sunni Muslim are terrorizing and killing these Ahmadi Muslim people and denying them their right to religious freedom. The Sunni Muslim terrorists have made the situation is so bad that an Ahmadi Muslim has to resort to making a new year resolution just to stay alive. The Sunni Muslims are terrorizing Jews, Christians, Hindus, Buddhists, and even Shiite muslims and Ahmadi muslims. This genocide needs to be stopped. As long as there are idiots that believe in mythical gods, there will be religious genocide. Sunni Muslims need to be stopped from carrying genocide of peaceful Ahmadi Muslims. Nobody deserves to make a new year's resolution just to stay alive from the murderous Sunni Muslims. Oh, shut the fvck up already!! You sound like a fvcking parrot! Bawk!